This paper was published on 06 August 2018 in the journal Disasters. *An brief introduction to methods and learning from the paper is provided below. Options to access the full paper are available here (limited access). The central question in this paper, is: how can appreciation of the socio-political context be embedded in resilience practice in conflict and post-conflict settings? To address this, we build on recent literature that has adopted a human rights lens to explore how resilience practice can expose how the institutional, political, and social environment leads to the inequitable distribution of resources and capacities of individuals within social-ecological systems. Specifically, this paper adopts a rights-based analysis to expose processes and forms of exclusion and marginalisation, many of which are feedbacks or unintended consequences that arise in complex social relations, as illustrated by the case of post-conflict Timor-Leste, where social conflict and the risks presented by environmental change are sharply defined. While this approach has wide relevance, the particular focus here is on resilience practice enacted through non-governmental organisations (NGOs) and movements. Resilience and the right based approach: Table 1 illustrates how the rights principles give rise to a series of critical questions that can be explored in relation to each rights regime, through participatory qualitative approaches with communities and stakeholders at different scales. These questions—in relation to the principles—translate concepts with respect to the power and social relations that emerge from the resilience literature into issues that have meaning to, and can be explored with, communities on the ground. Entrenched discrimination and inequalities are a particularly challenging target for resilience interventions, arising from norms and practices that are deeply rooted in the cultural, political, and social context. Climate change will probably reinforce the livelihood-related impacts of forms of difference that are expressed in resource access, whereas adaptation interventions will reproduce these subjectivities in the absence of deliberately targeted efforts to shift underlying discourses and narratives, alongside more readily observable practices. Women’s empowerment organisations, in which increased awareness of rights is wedded to practical measures to reduce financial dependency (through livelihood activities) and political dependency on men (through support for improved capacity for women’s representation), can, over time, challenge the processes identified above that close down accountability. Support for marginalised groups to claim and secure recognition for their entitlement is central to rights-based development actions, especially when coupled with awareness-raising and capacity-building in the political regime among those decision-makers responsible for securing (or undermining) those claims. Multi-stakeholder fora have been proposed as an approach to containing politics in ways that enable transformation through a focus on reworked relationships. For example, social learning platforms, in which multiple stakeholders look to understand their different perspectives and forge new knowledge through joint learning and action, have the potential to foster and underpin ‘more democratic governance’, as stakeholders engage in processes of defining problems and solutions, ‘examining the drivers of change, and discovering differential vulnerability among actors’. In Timor-Leste, interventions that work with the community leadership while supporting women or marginalised rice farmers in organising and representing their interests may help to improve transparency and reduce discrimination in decisionmaking, unlocking an important opportunity for more inclusive responses to environmental change. 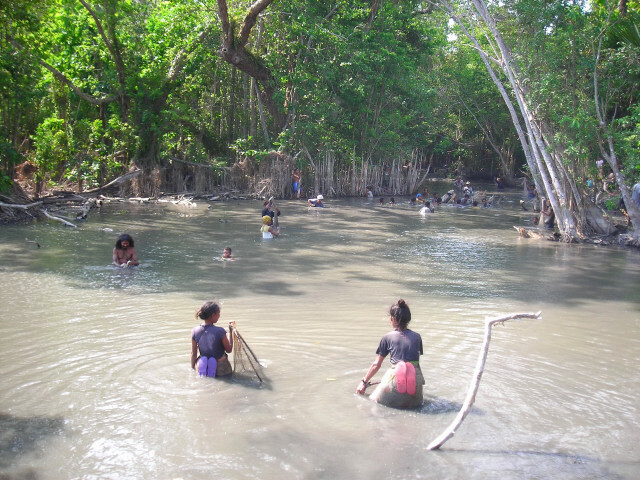 Significant in Timor-Leste is the presence of existing civil society networks advocating for accountability and transparency in administrative decision-making and recognition of the rights of subsistence farmers and fishers. The efforts of these groups to transform the relationship between the state and subsistence communities should be acknowledged and supported by external actors, who can offer resources, such as information and knowledge, or access to decisionmakers, that may not be accessible locally. This means, however, NGOs or other intervening entities ceding power and decision-making, negotiating their contribution in a struggle that is framed and owned by local activists. This paper responds to requests that resilience ‘engage with the insights and critiques from the social sciences about agency, power and knowledge’. It agrees with the view that resilience must be situated, to contextualise interventions. Resilience alone does not equip policymakers or practitioners with the conceptual or practical tools necessary to address the cultural, political, and social context within which hazards become disasters. In post-conflict settings, a key point of concern is those forms of social difference that are reinforced through cultural, political, and social norms and practices, and which underpin inequalities, sustain social conflict, and may give rise to future violence. A rights-based analysis has particular utility for meeting this challenge. A rights-based approach offers an ‘experientially based, empirically verified and theoretically supported’ form of analysis. This paper moves beyond recent studies linking rights and resilience, by concentrating on how human rights principles play out in the regimes in which rights are given meaning. It demonstrates the analytical significance of this approach in exposing the complexity of relations that are poised to reproduce entrenched patterns of conflict, risk, and vulnerability through resilience interventions. Situating resilience requires attending to this social complexity, alongside the more readily observable interconnections between human and environmental systems. 2. that actions on resilience must be understood to include actions in support of transformation, where transformation is required to address inequality. These insights take resilience practice beyond risk management concerns, to incorporate the forms of awareness-raising, capacity-building, networking, and support that can lead to profound shifts towards more equitable political and social arrangements. Interweaving resilience and rights-based thinking has the potential to deliver a politicised form of resilience practice that reduces, rather than reinforces, risk and social conflict. Ensor, J.E., S.E. Park, E.T. Hoddy, and B.D. Ratner (2015) ‘A rights-based perspective on adaptive capacity’. Global Environmental Change. 31. pp. 38–49. Matin, N., J. Forrester, and J. Ensor (2018) ‘What is equitable resilience?’. World Development. 109 pp. 197–205. Read the paper: What is equitable resilience?